Ilbert de Lacy was probably born in Normandy no later than the year 1045, which would make him at least twenty-one years old in 1066. He was still alive in 1090 but had died by the end of the reign of William Rufus who was shot dead in a hunting accident in the year 1100. That Ilbert and Walter were brothers seems probable as their land in Normandy was subsequently held jointly by their descendants under the Norman tenure of parage where land was divided amongst sons and daughters whilst remaining a single fee. This would mean that both Ilbert and Walter inherited the land from the same father. Their mother was named Emma de Lacy and there is a record of her granting 22 acres of land at Montmain to the nunnery of St Amand. She is described as the mother of Ilbert de Lacy to differentiate her from the abbess whose name was also Emma. This would seem to indicate that Ilbert was the elder of the brothers. Ilbert and Walter held their lands in Lassy of Odo, bishop of Bayeax – the man responsible for the tapestry. After the Conquest Walter was rewarded with lands in Herefordshire and Gloucestershire and Ilbert received over 150 manors in the west of Yorkshire, ten in Nottinghamshire and four in Lincolnshire. Ilbert built a castle at Pontefract and enclosed it in a park that was eight miles in circumference and from here he administrated his new estates. Ilbert was married to a woman named Hawise. They had at least two sons – Robert de Lacy who succeeded his father at Pontefract and Hugh de Lacy who died and was buried at La Trinite-du Mont in Rouen (the Abbey of the Holy Trinity) possibly around 1090 when Ilbert de Lacy and his wife granted their manor of Tingewick in Buckinghamshire to that abbey. Charter of a Norman conqueror recording gift of the manor of Tingewick in Buckinghamshire to the abbey of La Sainte Trinite. Authenticated by the crosses, presumably autographs, of King William Rufus, Ilbert de Lacy, and Hawise, his wife. 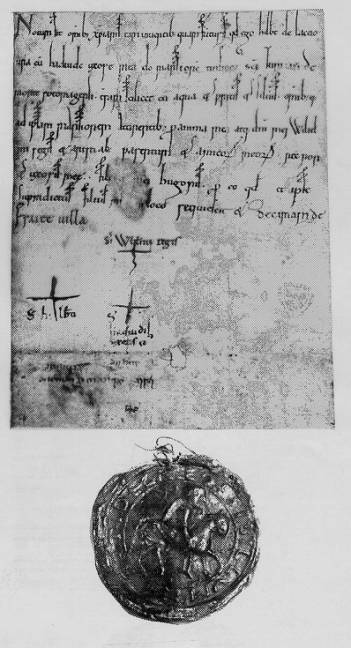 Ilbert’s seal is attached to the charter (the hole below Hawise’s cross). One of the earliest knightly seals in existence (c. 1090). The scribe is inconsistent in spacing, size of script, and spelling, suggesting lack of familiarity with this type of document. From Michael Clanchy, From Memory to Written Record: England 1066-1307. 2nd ed. Oxford: Blackwell, 1993, plate I. Other grants made by Ilbert de Lacy were the manor of Hambleton to Selby Abbey (before 1997), the manor of Garforth to St Mary’s Abbey at York and a gift of two pence to Durham Cathedral priory. It is also probable that Ilbert granted permission for one or two hermits to live on land that later became Nostell Priory. He also made a grant to the chapel of St Clement, built within the walls of Pontefract Castle. Exactly when Ilbert de Lacy died and where he is buried is unknown. Which of your books has this character? I am related to him way back. (don’t know if my comment got through). My geneology (my uncle did, I don’t know exactly how) says born 1045 says his death date is 1093. Again, don’t know where I got it. Hello Kerry. I’ve written three books that tell the story of the de Lacys. The de Lacy Inheritance tells the story of Robert de Lacy and Roger de Lacy. Favoured Beyond Fortune and The Circle of Fortune are about Alicia de Lacy. I haven’t written Ilbert’s story yet, but perhaps I will in the future. Thank you for replying (last year! wow) to my question. I’ve been curious about the de Lacys for mysterious reasons…including a shaman’s suggestion that a dutchess or countess from my ancestry hangs around me, and I’d know her by the lace? -just a clue. As shamanic visions go, this could mean a lot of things, but since I found the family name, I may work with it. And must read your books! Hi Cousin Kerry, hope this reaches you. I am a direct descendent too. If you want to friend me on Facebook, I can let you know what I find out about our family as I learn myself. I’ve been to the UK many times but it’s only recently that I’ve been able to trace my roots back all the way to the Norman invasion and further. The information on Ilbert Marshall, father of Emma de Bois L’Eveque and grandfather to Ilbert de Lacy is in the book ‘The Baronage of England’ in the section “The Legacy of the de Lacy…..Family”. Yes. That’s right. Dugdale’s book is the source of this information. The problem is that he is not entirely reliable and I’ve been unable to find other sources that confirm his assertions. I like to use primary sources wherever possible such as charters and deeds, etc. Pardon my ignorance, but I am just wanting to clarify – was Ilbert de Lacy a knight before being made Baron and being granted his fiefdom? Many thanks, Stacey. Hello Stacey, so little is known about Ilbert before he came to England that there is no proof of his having been knighted, but I think it is probable. It is unlikely that he would have been rewarded so well if he hadn’t already been a man with a relatively high status. Thanks for this Bruce. I’ve had the name Emma de Bois L’Eveque from other sources too. But I didn’t know her father was a Marshall. My research says Emma de Lacy was known as Emma de-Bois L` Eveque. And that she was the second wife of Hugh de Lacy, Lord of Lassey, Normandie. in Normandie. The de Lacy surname derives from the Lassey location as well. was Emma’s father identification as the person in charge of the horses. To Ralf the Red. Do you think it exists?